For some reason my custom screensaver works or doesn’t, depending on the day (or the phase of the moon or whatever, who knows!). Most of the time it doesn’t and I give little thought to the photos, graphics and artwork that I’ve dumped in that particular file over the years. Every now and again, it catches me by surprise … and pops up out of the hinterlands with a forgotten image. Like tonight. Which managed to bring a tear, unbidden and unwelcome. 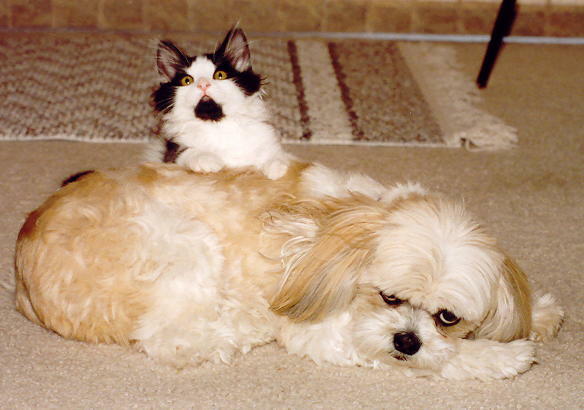 The photo is of my first Apso, Brittany and our current resident marble-brained feline, Boogins. Bless her pointy little head, Brittany took this spastic, out-of-control, almost-feral kitten and taught him how to be a good dog … for a cat, that is. Her lessons have served him well as he’s educated every foster in the interim on how to live with a cat. Still don’t know how I managed to get this photo of the two of them as Boogins was akin to a fart in a whirlwind most moments, rarely still unless it was to eat or sleep. We lost Brittany in 1999 to IMHA — immune mediated hemolytic anemia — just months shy of 14-years old. Boogins, now at 13, is beginning to show his age with the thinning of body fat and hair. His vocalizations are beginning to “thin” as well, becoming more of a squeak instead of the full-bodied meow so familiar. Ever aware that I have four senior animals in the house, the next four to five years will be difficult at best. Living in the moment, I’m able to sweep that ache to a corner where it can reside quietly, all too mindful of the transient nature of their being. Yet, at odd times … I’m reminded of just how deeply my old friends are missed. Evanescent spirits just out of touch, but ever present. I love your picture! 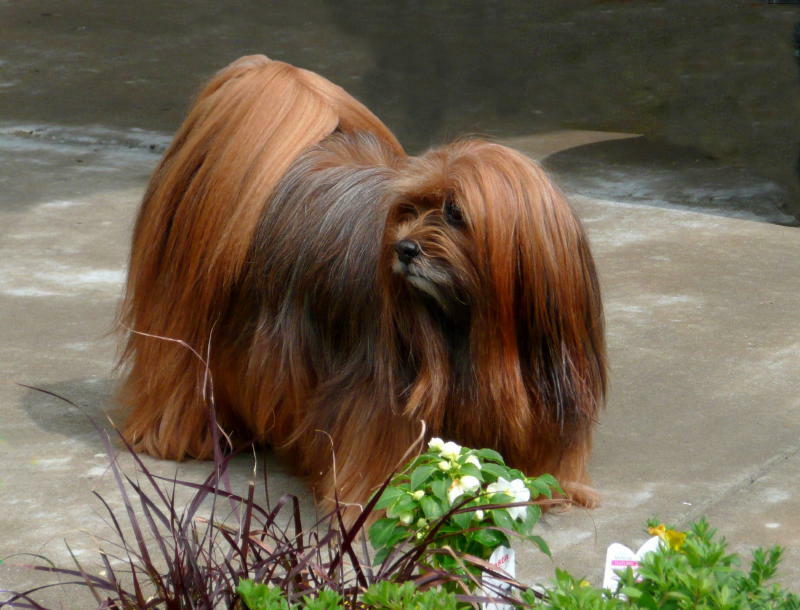 I found your blog on a search for Lhasa Apso blogs. My Lhasa, Max, whose coloring was very similar to yours in the picture, died just over a month ago. He had kidney disease and I ended up putting him down. I miss him alot, but enjoy reading your blog. Thank you for sharing your experiences with Lhasas and for helping them! Maybe out of sight, but never out of mind, are the wonderful memories of a beloved pet. There is so much you may never find out because your companion, was a rescue. What did they endure? Then end up having the rest of their life, happy and sweet. If only all the animals were as lucky as the rescue that you found and saved. Thanks for sharing your great picture. CC … my condolences on the loss of Max. Never easy losing our long-time friends. May you find comfort in his memory in the days to come. Brittany is so cute! She reminds me of Brandy. I also got Brandy from a pet store long before I knew anything about the horror of puppy mills. She had luxating patellas, came down with IBD at age 3, food allergies, eventually cranial cruciate ligament tears in both knees and Cushing’s disease. After the Cushing’s diagnosis she developed a malignant lung tumor and several months later, an enlarged right adrenal gland. Whew! Never again will I buy from a pet store!